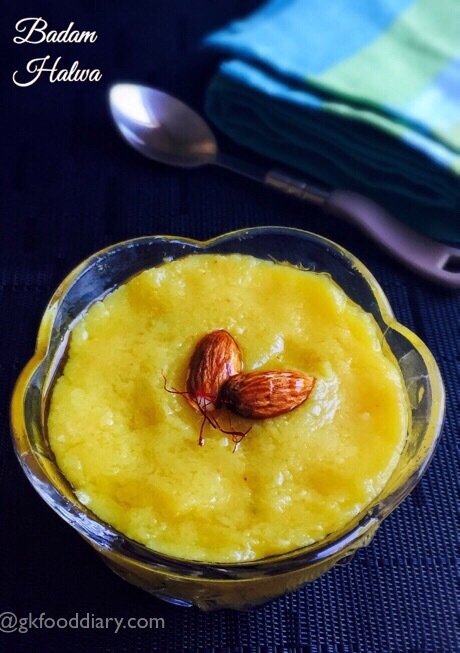 Badam Halwa/Almond Halwa- a delicious traditional Indian dessert made with almonds, ghee, milk and sugar for toddlers, kids and for the whole family. Almond halwa is my mom’s signature dish which tastes out of the world and she makes it in a giffy whenever we ask for it. Its also very easy to make and even a beginner can give a try! 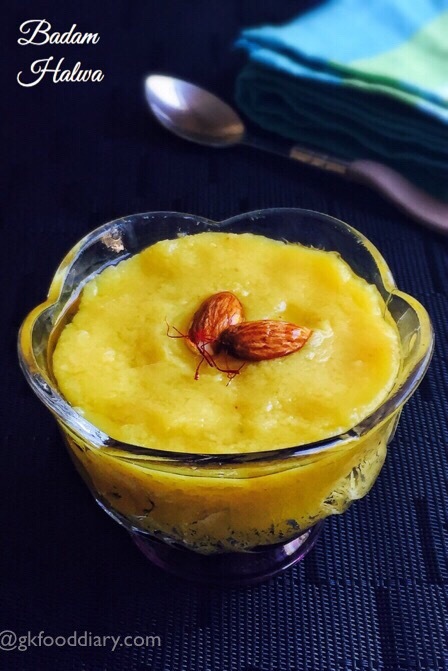 Almond halwa is a winter special delicacy which is especially good for kids advice as its loaded with protein & carbohydrates hence it gives instant energy. It can be given to kids from one year. So what are you waiting for, prepare the delicious badam halwa this winter and let your children have a spoonful of this wholesome halwa. 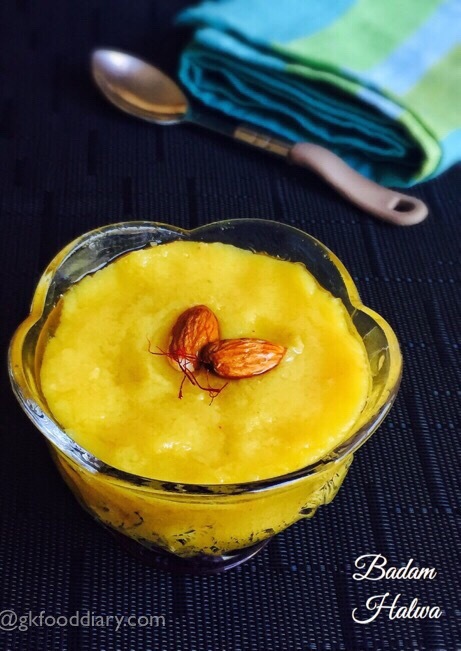 Now Let’s check how to make this almond halwa recipe for toddlers and kids. 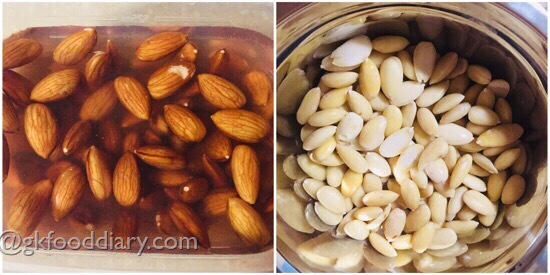 Measure and Soak almonds in water for 4 hours. Then peel the skin and keep it ready. 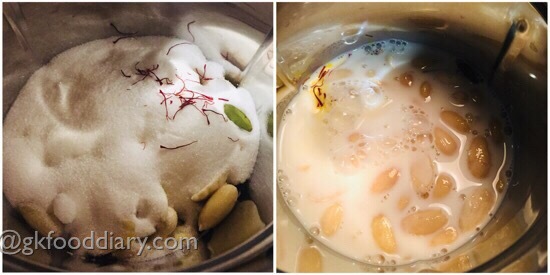 In a big mixie jar, take peeled almonds, sugar, saffron and cardamom. Finally add milk to it. Grind everything to a coarse paste. Set aside. 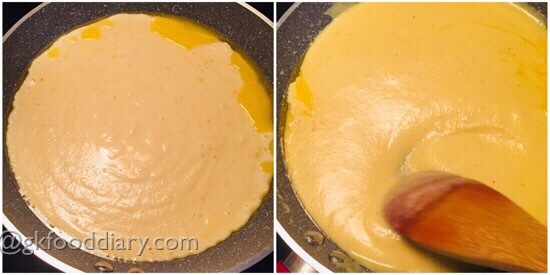 In a thick bottomed pan, add 2 tbsp of ghee and melt it. Add the ground coarse almonds paste. Keep stirring it continuously. Now the halwa starts liquidized. Keep stirring it and add the remaining 2 tbsp of ghee little by little. When the halwa forms a whole mass and doesn't stick to the pan, its done. Switch off the flame once done. You can also check the halwa consistency as below: take a tiny portion of halwa,cool it down a bit, form a ball. the ball should should be soft neither sticky nor wet, That is the correct consistency for badam halwa. 1.Measure and Soak almonds in water for 4 hours. Then peel the skin and keep it ready. 2. In a big mixie jar, take peeled almonds, sugar, saffron and cardamom. Finally add milk to it. 3. Grind everything to a coarse paste. Set aside. 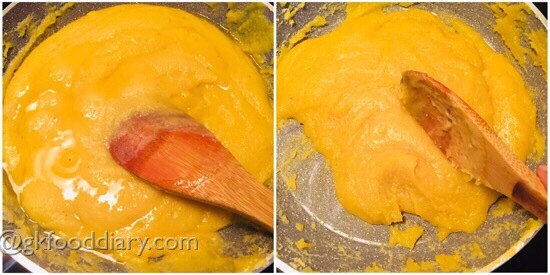 In a thick bottomed pan, add 2 tbsp of ghee and melt it. 4. Add the ground coarse almonds paste. Keep stirring it continuously. 5. Now the halwa starts liquidized. 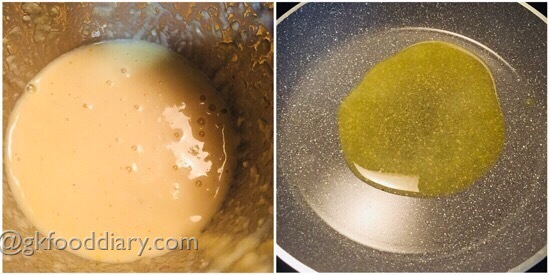 Keep stirring it and add the remaining 2 tbsp of ghee little by little. 6. When the halwa forms a whole mass and doesn’t stick to the pan, its done. Switch off the flame once done. 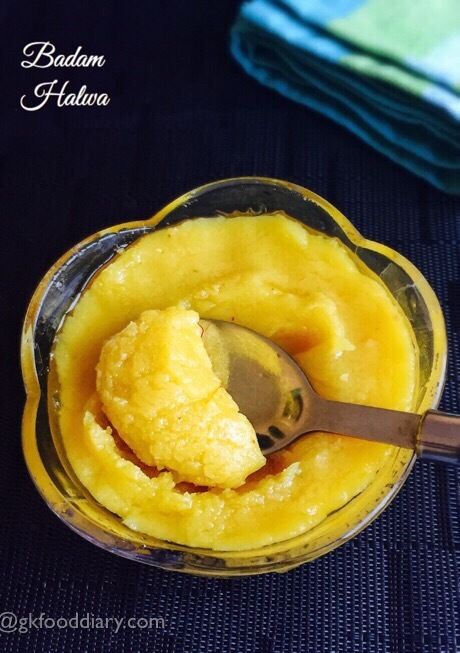 You can also check the halwa consistency as below: take a tiny portion of halwa,cool it down a bit, form a ball. the ball should should be soft neither sticky nor wet, That is the correct consistency for badam halwa. Delicious Almond halwa is ready ! 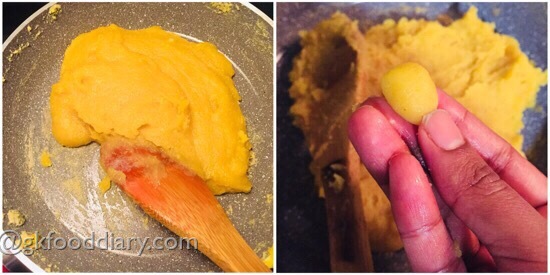 Adding saffron gives a nice yellow color to the halwa. Don’t skip it. Badam halwa stays well for 4 days if refrigerated. Do the whole process in low medium flame in order to avoid burning in the bottom. You can also the blanch the almonds in hot water if you want to skip soaking and save time. How many times in a week tis can b gvn to 2.5 year kid…can I gv tis as a snack for my playschool going kid…does it causes any stomach problem?? You can give a 1 to 2 big spoons of badam halwa per day preferably morning after breakfast .. it wont do any harm..
Hi what we can give instead of sugar. i am adding more Sugar. I just want to change that to my one year old. So please suggest me. Thanks in advance. jaggery, palm sugar, palm jaggery or brown sugars are best alternatives of sugar. you can also prefer fruits to satisfy sugar carvings.